And here come the pre-holiday weekend deals. Amazon has announced a new penny sale that drops the price of all Verizon, Sprint and AT&T phones to just $0.01 from now through Cyber Monday. 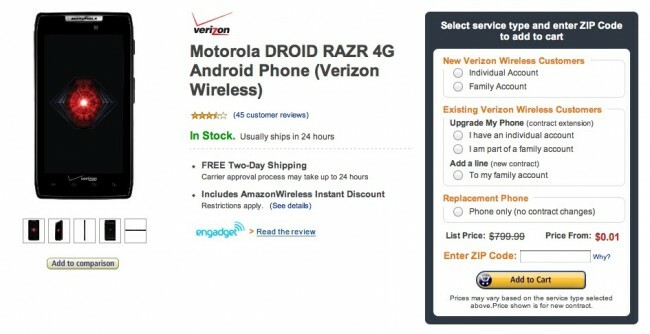 When we say “all,” that means the DROID RAZR and HTC Rezound are included in that list. .
You won’t be able to use an upgrade to get this deal, but can by adding a new line to your current account. Also, if you add on a WiFi hotspot package, Amazon will kindly toss you a $100 gift card.